I had heard about this place for years, and it was always one of the most exclusive places going. A few friends had fished it back in the late 80s and early 90s, before I started seeing and hearing a lot more about the place again in recent times. It has always been kept under wraps, and with good reason too. Before last season, there were only a couple of lads allowed to fish it. Knowing what was in here, allied to the fact that only a couple of lads could fish it, meant I didn’t really give it too much thought over that period. It was one of those places that you just had to accept you wouldn’t be able to fish. However, in 2017, a small syndicate was formed and within it were a few close friends. As the ticket was due to start in September, one of the lads dropped out and my name was put forward. To my surprise, and delight, I was offered the place and I didn’t hesitate in taking it. The lake is around 47-acres, fairly shallow overall, with clear water, bars, gullies, huge weed beds and a jungle of snags. I have never seen so many snags in a lake; they don’t just frequent the margins, they are also out in the open water, covering the bars. I wouldn’t like to say how many acres of snags there are out there, but the fish do spend a lot of time in them, especially when there is a bit of pressure on the lake, the fish will retreat to the snags for safety, which can always make things tricky. They also dictated the way you fished too, in terms of the gear used, in order to fish safely. There isn’t an exact number in terms of stock, as it was closed in 2000 for the foot and mouth disease. Since then there has been a handful of people fishing it, so knowing the numbers without even knowing the initial stocking is tricky. Most suppose that there are roughly 60-80 carp present, but it is still very much an unknown quantity. A lot of the fish that I started seeing, and some of the other lads, were not recognized. Some of the bigger ones have only been caught once or twice in the last 10 years, which makes it even more special. Before I knew I was getting a ticket, my friend Lee was fishing his first weekend of the season on there and I was chatting away to him about the place. Even the thought at the time of one day fishing that place got me all buzzed up. The following morning, he actually caught the big scaly mirror, a truly mind-blowing carp and a dream capture for sure. It was soon after that I got the nod and took my ticket. After seeing that one and knowing of so many of the others, it was a dream come true. I received my ticket in October, whilst fishing elsewhere. I spent a bit of time that winter having a little look round, often in the boat, just to get an idea of the lake. I was eager to fish from the boat, as it was something I hadn’t done much of in the past. With the water being so clear, you could see the bottom without even using a viewing bucket, so learning the spots and the carp’s feeding behaviour was something that could only help me in my fishing at a later date. I got the rods out around 7pm and a few hours later at around 2am I got a couple of beeps. I was fishing locked up, so knew it was a bite! I picked up the rod and everything was solid. I jumped in the boat and went out using the outboard, gently winding down to it. As I got near it, a big eruption appeared on the surface, and I was back in contact with clearly a big fish. It didn’t put up much of a fight after that, which was fortunate, as it was one of the big mirrors. It was one they call the Long Island Mirror – one of the really special ones. I got it back to the bank and slipped her in the sack for a couple of hours. 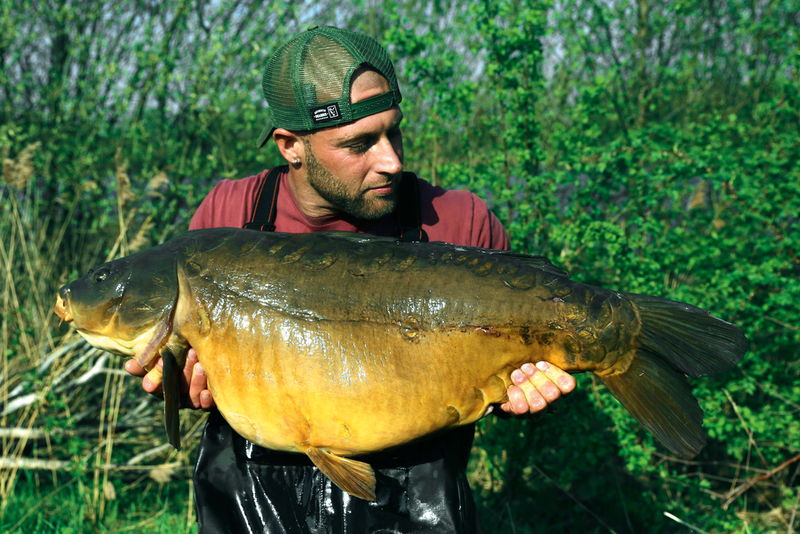 We got her out and she looked awesome – 40lb 6oz of incredible old carp. I saw a fish show at first light, to the left of the swim and, upon closer inspection, it appeared there were a few present, bubbling up consistently over one area. I cast a single hookbait to them and only half an hour passed before that rod was away. Every bite is such an adrenaline rush on there and this was no different; even though it ended up being a high double, it was a special feeling to have caught another one. Any fish from this venue is a result and I went away extremely happy with the first trip. 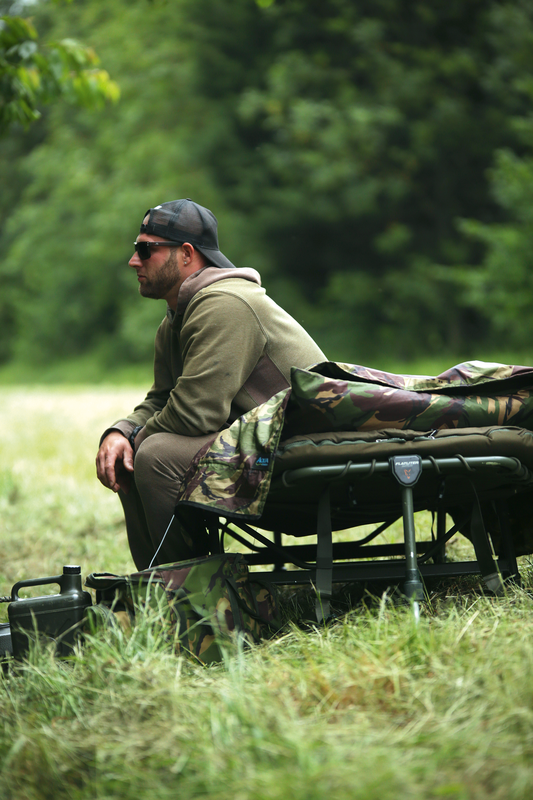 Two long weeks had passed before I could get down again and, with a few lads on, I looked in the areas that I could without disturbing anyone else’s fishing. I found some fish in an out of bounds area, where they spend a lot of time during the day. I set up in the swim that accessed that water in the entrance to it, hoping that the fish would leave during the evening and night time. I watched that evening and I could see them cruising along the surface and dropping down to the spot. It looked promising and I went to bed full of hope, but I didn’t wake until first light and nothing had happened. It looked dead in front of me, so I jumped in the boat and had a venture round and I found a big group of fish feeding in a shallow corner of the pit. I could see the coloured water from a distance, so turned the motor off and gently glided towards the area. As I got closer, I could see dark shapes disappearing from the misty bottom – they were here and happily feeding on something. The problem was the area had no access to get a rig to them. I spent the whole afternoon cutting out a swim, removing certain snags that would allow me to get a line to where the fish were feeding. They were there in numbers and I was convinced that they would be back, so it was worth the three or four hours worth of effort. 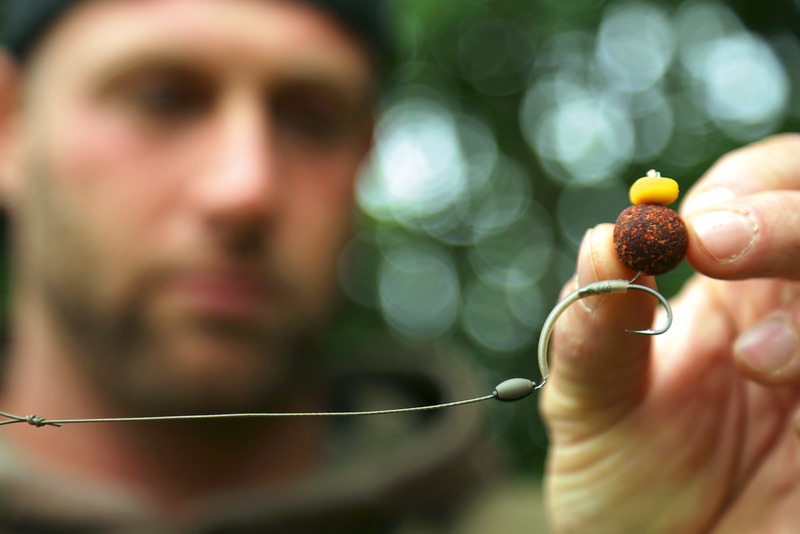 The rigs were sorted – simple Withy Pool rigs fished with a home-made Krill pop-up, down to a lead clip and a large gripper lead. I was dropping them from the boat, so wanted a nice big lead to prevent it from being moved while going back to the bank and it would help drive that hook home should a fish pick up the rig. I dropped the rigs on to spots that had clearly been fed on and gave them around a kilo of bait over each spot. I had a simple mix of both whole and chopped Krill boilies, Krill pellets and some sweetcorn, all soaked in the Pure Krill Liquid. That evening, not long after getting the rods out, I received a take on the left-hand rod. The fish went off like a train and ended up going underneath my other rods and pulling both the lines tight. I was sure that it would have moved the leads, so when I landed the 21lb mirror, I decided to reposition the rods. Instead of reeling them in, I wanted to go out and check if it had actually moved the leads or not, just for future reference. As I approached, I could see a large patch of fizz appear over the spot. Amazingly, a fish had picked the hookbait up, but, with the motion of the boat going forward, the fish was in the snag within seconds. I had no net with me and I was in a right pickle, eventually losing the fish. I got all the tackle back which was nice, but I was still gutted to have lost one. I had another small one during the night and lost yet another fish, this time due to a hook pull. The move had paid off but losing fish from a lake like this is a real killer and I couldn’t help but feel slightly dejected as I left that morning. I was back a couple of weeks later, this time just for a single night. The lake was fairly busy, but I pulled up to an area of the lake that had access to a good chunk of open water. It is a great passing point for a few sections of the lake, so I stood there for a while to see if I could see anything. With nothing doing, I nipped out in the boat and I found a number of fish sat in the snags, but also the odd one drifting round in open water. The weed was getting up and that added protection was tempting the fish out in the open water, which made a refreshing change to them hiding out in the ‘woodwork’. 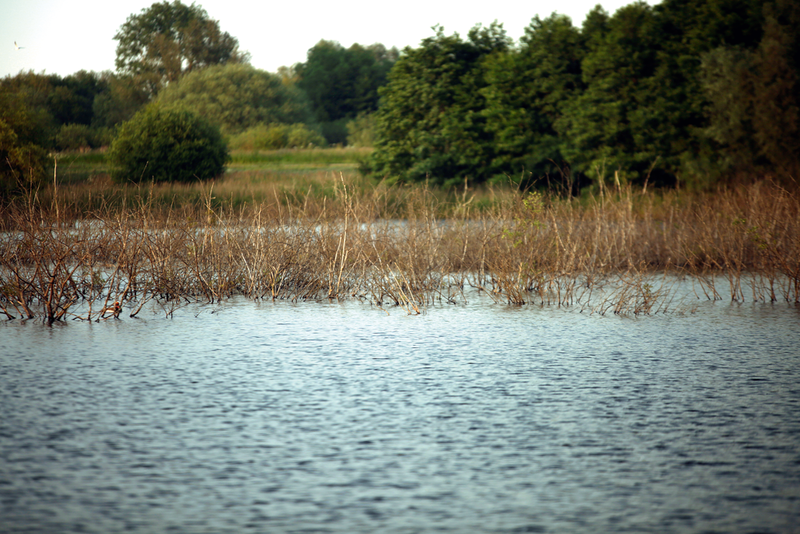 I made myself busy and soon had three rods in place, all on clean spots tight to the weed, and in areas that I had seen fish passing through. That evening I could see them sheeting up, with great plumes of bubbles hitting the surface of the lake and they seemed to be really active, I was convinced a bite was on the cards. It came half an hour before dark, but unfortunately the hook pulled. I was fishing with hand-sharpened hooks, but sometimes if they go in the wrong place, it can hit the bone and you can be a bit unlucky, burring the point over. I dropped the rod back out there and while settling the line, the other rod was away. I was on it in a flash and a big bow wave charged off the area. It found weed instantly, burying itself and becoming immovable so I took to the boat. I got out there, pinging the line off various weed beds as I went. I eventually managed to get the fish moving, before it went berserk, flattening my rod and stripping line. It is hard to gain control in a boat, but I did all I could and eventually netted a cracking looking mirror. It went 29lb 6oz and was a real character. One of the main reasons for fishing this lake, in my opinion, was the diverse and beautiful stock, and this one ticked all the boxes.